Co. Dublin: Balbriggan (3), Ballyboghill, Balscaddan, Clonmethon, Donabate (2), Hollywood (2), Holmpatrick (2), Kilsallaghan (2), Kinsealy [Kinsaley], Lusk (3), Malahide (2), Swords (3). The Board also included 7 ex-officio Guardians, making a total of 30. The population falling within the Union at the 1831 census had been 28,124 with Divisions ranging in size from Clonmethon (population 890) to Balbriggan (5,078). The new Balrothery Union workhouse was erected on a 24-acre site about three miles to the north-west of Lusk. Designed by the Poor Law Commissioners' architect George Wilkinson, the building followed one of his standard design to accommodate 400 inmates. Its construction cost £4,945 plus £905 for fittings etc. The site location and layout are shown on the 1909 OS map below. The workhouse was declared fit for the reception of paupers on 1st February, 1841, and received its first admissions on 15th March. During the famine in the mid 1840s, a 48-bed fever hospital was erected at the east of the main building. Additional accommodation was provided by erecting additional sleeping galleries, and by taking over the workhouse officers' accommodation. 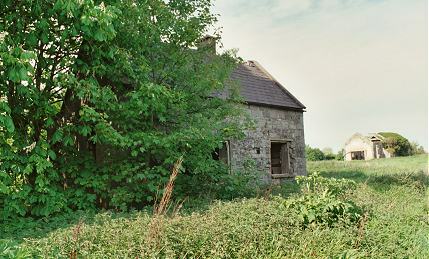 The workhouse had a burial ground situated across the main road, a quarter of a mile to the north-west of the workhouse. During the First World War, the workhouse is believed to have been used to house Belgian refugees. 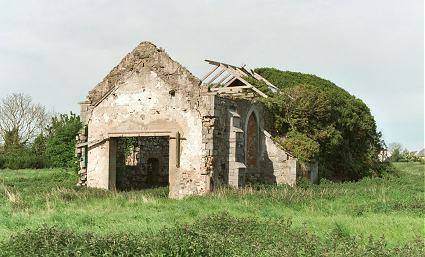 The buildings no longer exist except for the derelict remains of a small part of the entrance block, and the chapel, which was originally the central rear section of the main building.